With that out of the way, let’s get on with the show. While I may often give Brian Michael Bendis a hard time about his (in my opinion) over-the-top senses writing or his less than impressive handling of Daredevil in the New Avengers, there should be no doubting my generally strong approval of his time at helm of the Daredevil title a few years back. 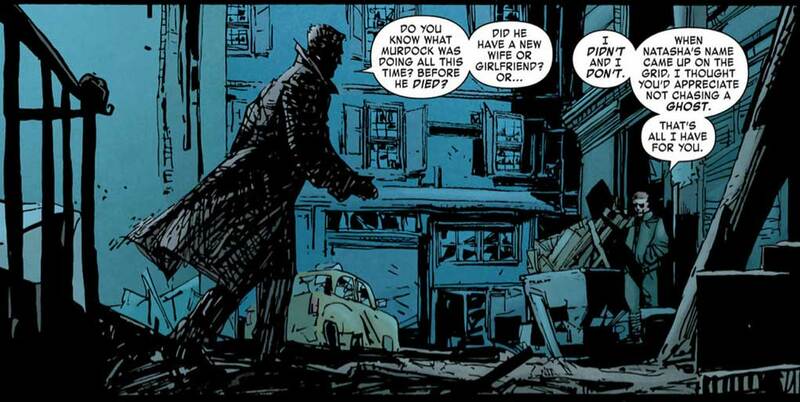 Many of my absolute favorite Daredevil scenes are from the Bendis/Maleev run. I liked its strong focus on Matt’s humanity, dry sense of humor in the face of adversity, and Bendis’s writing of Foggy Nelson was nothing short of superb. He did more to elevate Foggy to competent lawyer status than any writer before him and really made his friendship with Matt seem genuine. Daredevil: End of Days #2, written by Brian Bendis and David Mack, reminds us of many of the things that made Bendis’s previous work stand out. One of the strengths of the series so far is allowing Ben Urich to be the narrator and central character of the story. Bendis used to write a great Ben Urich, and ably assisted by David Mack, he certainly hasn’t lost his touch here. The two really get the character, and the mystery he is presented with provides enough reason for Urich’s trek across town in search of people who knew Matt, ghosts in some cases. For the most part, this issue holds up well, and the art by Klaus Janson is very strong and very successful in capturing the slightly dystopic atmosphere of this not too distant future. But… (Yeah, you knew there was a “but” coming, didn’t you) there are aspects of this story that don’t quite sit right with me. While I’m more than happy to see this story of a possible future as something that doesn’t adhere to main continuity – in fact I prefer the alternate universe approach – it does seem almost too much like a flashback to when Bendis left the book with little indication that anything worth noting happened after that. There’s nothing wrong with that per se, but it’s a bit jarring. Milla’s past(?) madness is not mentioned or even hinted at, and the fact that she’s got a red-headed son, that we’re probably supposed to assume is Matt’s son. Then again, he might only exist as a reason for Milla to slap Ben across the face. Speaking of jarring, I also must admit that it almost took me out of the book to see her portrayed as sighted. It may seem like I’m nitpicking, but it’s a very strange and completely unnecessary oversight that makes me wonder whether the otherwise spectacular Janson missed a memo or something. At the end of the day, this is still an enjoyable story with a strong concept, but I do have my reservations going forward. The next couple of issues will decide whether I’ll continue to appreciate the world these creators have built or whether I’ll find myself with more reasons to be ever so slightly perturbed. The major disappointment of this series so far is Bendis has ignored developments outside his own run (a shame since the transition to Brubaker was so seamless I consider Bendis/Brubaker a combined, mega-epic saga). Milla being a) not crazy and especially b) not blind really took me almost entirely out of the story. The former I could say is a consequence of Bendis treating his run as self-contained, but how does anyone in the creative process forget she’s blind when it’s arguably her defining characteristic and Bendis CREATED her. Maybe it will be explained in the remaining issues – overall I am still enjoying it and very interested in seeing how the story plays out. Only one panel of Matt Murdock/ Daredevil in the entire issue. Yeah, Milla apparently not being blind. Who is supposed to be on the front cover? Bullseye? Great review, I have mixed fellings about this one too. The artwork is a bit rushed on some places. As for the argument, this issue is better than the first, I have some complaints besides the ones you mention on your review. The main one is the presence of Elektra. For me the character died back on DD 181, and never resurrected. When Bendis was the regular writer of the title, Elektra and Typhoid Mary s appearences were handled with class, homages of the past rather than characters the story revolved around. This time is different Elektra is on center stage, a fact I don t like. My shop finally got their orders for this issue in this week (due to a diamond error). Having read this last night, I’m so confused about Milla. Has there been a comment by Bendis or anyone on the book about her obvious ability to see? I can’t seem to get over this. I love the art in this, but I would kill to see the script for this issue to understand the Milla sequence.